The car ride up from Furano was filled with the boom boom beats of French house music. The previous day we had skied Asahidake in typically deep snow storm conditions that Daisetsuzan is known for. 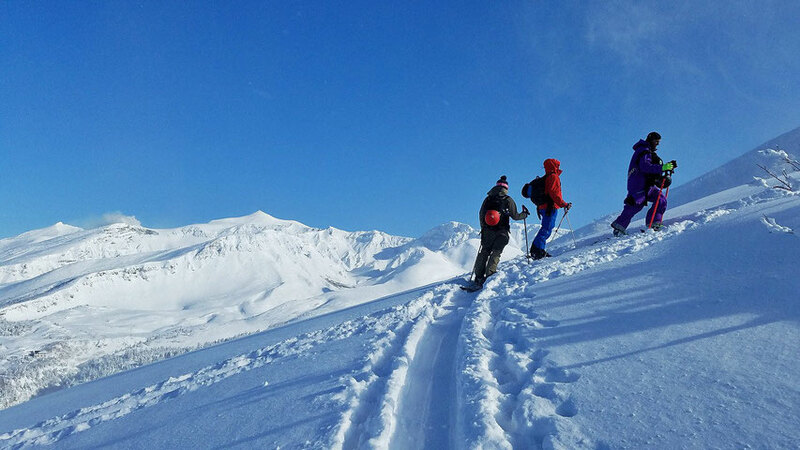 The group from France still seemed high from skiing Asahidake and were looking forward to another deep powder outing, but this time we had the sun, and visibility. The forecast of cloudy and occasional flurries wasn't what we were seeing. We could see the Tokachidake high alpine and the up-beat music reflected our optimism for an amazing day of skiing. 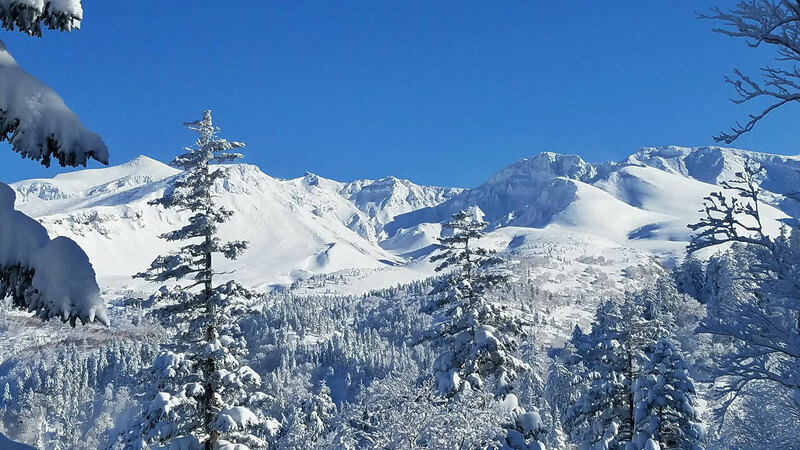 When the conditions are right, this is the mountain that we want to ski in the Tokachidake area. 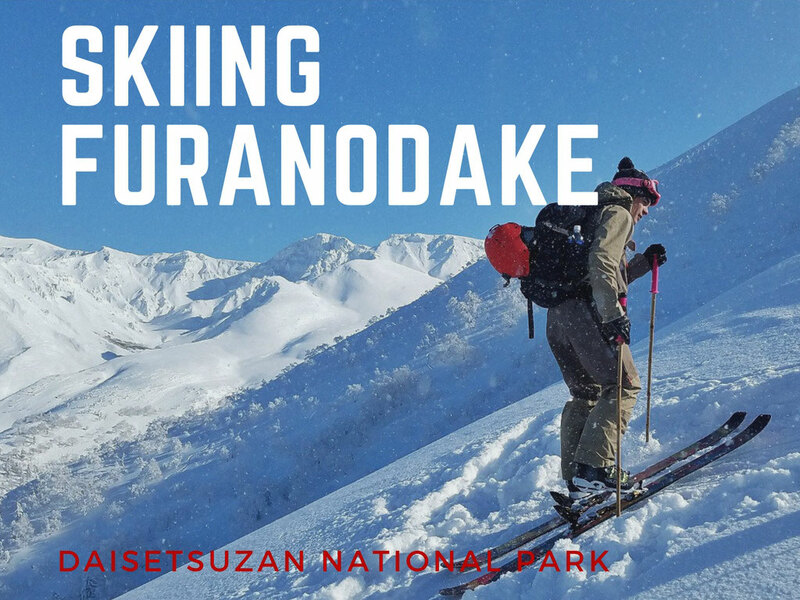 It has the steepest terrain of any of the mountains at the southern end of the Daisetsuzan National Park and combines alpine and widely spaced old growth tree skiing. The bowl, which can be seen from the carpark is known as 'Giant' to the locals, probably because other backcountry zones are dwarfed by the size of the terrain. It is a beautiful ascent through the forest. Old growth spruce known as 'akaizomatsu' that mature to 900 years of age stand in all their grandeur. Tons of snow sit on their branches from continual snow storms through the winter, Ascending higher are the rime caked silver birch that glisten in the morning sunlight. Once out of the trees, there are views of the smoking volcano of Tokachidake. The pace of our ascent seemed out of kilter with how we had skied the day before. All in the group were expert skiers and snowboarders who skied fast, and delighted with egging each other on through the deep turns and any jump they could find. The pace uphill was slow, not from any lack of fitness but more from the awe of the surroundings. Blue sky days are so rare during January and February, that I must admit to never feeling any apathy to the beauty of these mountains myself. 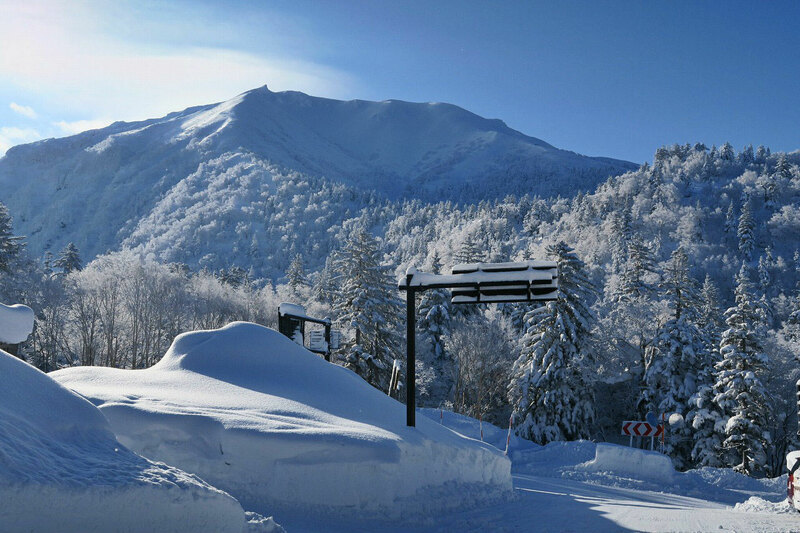 The ski zone of Furanodake doesn't take you to the summit of the mountain, rather a false summit on its western side. This is partly due to the accessibility from the road, and that the offers the best skiing on the lee side of the mountain. 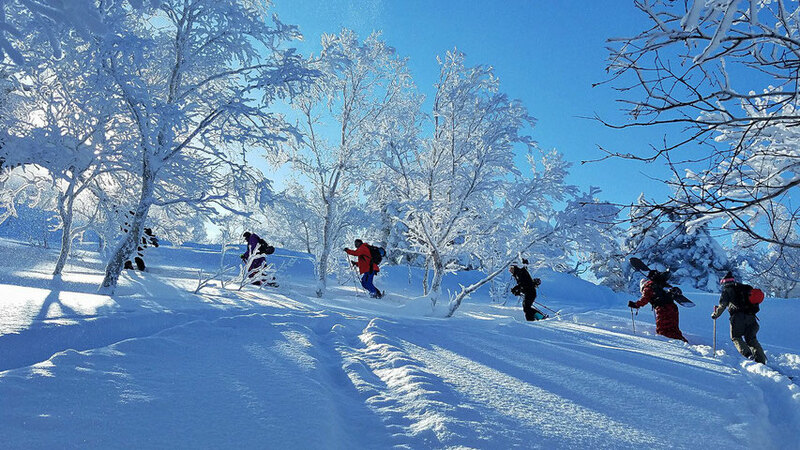 From the false summit there is around 750 vertical meters of skiing back to the road at 1,000 meters elevation. A strong group will ski two or three runs in the upper bowls of the mountain before descending all the way down to the car. 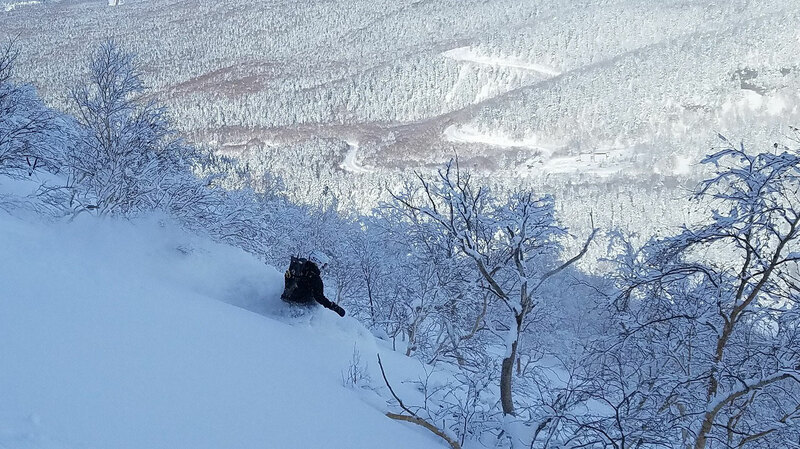 When the snow falls in this part of Japan without the wind, I have often heard that it is the best quality powder in the world. Certainly it is some of the best. On the descent, the French crew couldn't contain their excitement for the snow they were riding. The wind had picked up through the day, but the bowls were sheltered enough to maintain great quality. 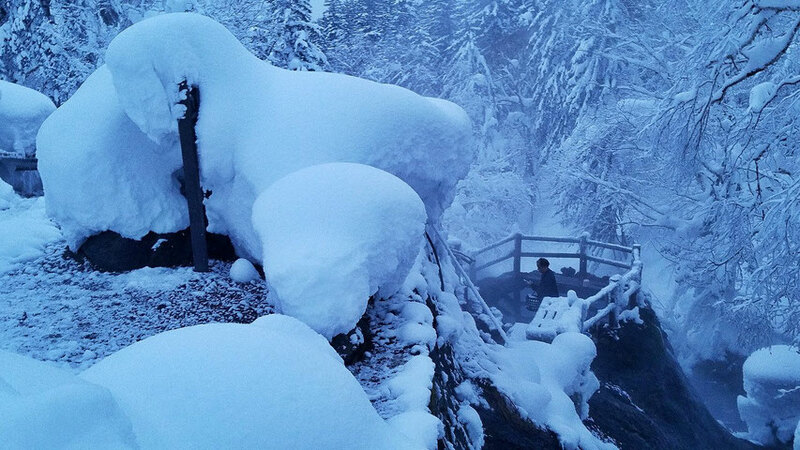 We finished the ski day with a soak in the hot thermal waters of Fukiage hot spring. Word has it that it was one of the first springs in the area, only to dry up after one of the volcanic eruptions. It wasn't until the next eruption that the waters started flowing again. A short walk in to the forest reveals the steaming 45 to 48 degree C waters, depending on the day. Most commercial springs will regulate the temperature by mixing in some cold water, which this natural spring doesn't have. Some days it is easier to stand naked in -15 degrees than jump in to the scalding waters. The local spring goers will sometimes give you dirty looks if you start shovelling snow in to the water in an attempt make it easier to get in. Once in and used to the water, it is wonderful. It's definitely a great way to end a day's skiing.